St Herman, for many the Patron of North America, was born near Moscow around 1756 to a pious merchant family, and entered monastic life at the age of sixteen, at the Trinity - St Sergius Lavra near St Petersburg. While there he was attacked by a cancer of the face, but the Mother of God appeared to him and healed him completely. He was tonsured a monk in 1783 with the name of Herman (a form of Germanos), and was received into Valaam Monastery on Lake Ladoga. After some time, he was allowed to withdraw to the life of a hermit in the forest, and only came to the monastery for feast days. In 1793, in response to a request by the Russian-American Commercial Company for missionaries to Alaska, Valaam Monastery was told to select a company of its best monks to travel to America. Eight were chosen, of whom the hermit Herman was one. The company crossed all of Siberia and , almost a year later, first saw Kodiak Island in September 1794. The missionaries set about their work, and found the native Aleut people so receptive to the Gospel of Christ that in the first year about 7,000 were baptized and 1,500 marriages performed. Despite severe hardships, the missionaries covered huge distances, on foot and in small boats, to reach the scattered fishing settlements of the Aleuts. In general they found a warm reception, but many of the pagan shamans opposed their message and sometimes stirred up the people against them. It was thus that the Priest-monk Juvenaly was killed in 1796, becoming the First Martyr of North America. Despite such opposition, the missionaries' major difficulty was with the Russian traders and settlers, who were in the habit of exploiting the Aleuts as they wished, and who had oppressed and disgusted the native people with their immoral behavior. When the missionaries came to the defense of the natives, they were repaid with the opposition of the Russian-American company, whose leadership put countless obstacles in the path of their work. In time, several of the company died at sea, and several more abandoned the mission in discouragement, leaving the monk Herman alone. He settled on Spruce Island near Kodiak, and once again took up the hermit's life, dwelling in a small cabin in the forest. He spent his days in prayer and mission work, and denied himself every fleshly comfort: he fasted often and lived on a diet of blackberries, mushrooms and vegetables (in Alaska!!). Despite these privations, he founded an orphanage and a school for the natives of the island, cared for the sick in epidemics, and built a chapel where he conducted divine services attended by many. (He was not a priest, but God made up the lack in miraculous ways: at Theophany, Angels descended to bless the waters of the bay, and the Saint would use the holy water to heal the sick). Asked if he was ever lonely or dejected in his solitude, and replied: "I am not alone; God is here as everywhere, and the Angels too. There is no better company." Saint Herman reposed in peace on Spruce island, at the age of eighty-one, in 1836. At the moment of his departure, his face was radiant with light, and the inhabitants nearby saw a pillar of light rising above his hermitage. His last wish was to be buried on Spruce Island. When some of his well-intended disciples attempted to take his relics back to Kodiak to be buried from the church there, a storm rose up and continued unabated until they had abandoned the plan and buried him as he desired. He was officially glorified in 1970, the first canonized American Saint. Saint Peter was a young Aleut convert to the Orthodox faith. In 1812 the Russian- American Company set up a post in California, where Russians and Aleuts farmed and traded to supply the needs of the Alaskans; Peter was one of these. The Spanish, who at the time ruled California, suspected the Russians of territorial ambitions, and in 1815 captured about twenty Orthodox Aleuts and took them to San Francisco. Fourteen of these were put to torture in an effort to convert them to the Roman Catholic faith. All refused to compromise their faith, and Peter and a companion were singled out for especially vicious treatment: Peter's fingers, then hands and feet, were severed, and he died from loss of blood, still firm in his confession. The Latins were preparing the same fate for the others when word came that they were to be transferred; eventually they returned to Alaska. When he heard a first-hand account of Peter's martyrdom, Saint Herman crossed himself and said "Holy New Martyr Peter, pray to God for us!" Saint Peter the Aleut is the first recognized Saint of American birth. 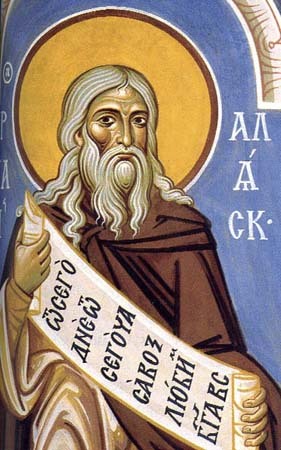 St Herman appears several times on the Church's calendar. The Synaxis of St Herman and the American Protomartyrs is celebrated today. St Herman is commemorated on November 15, the day of his repose; but (partly because pilgrimage to Alaska is so difficult in the winter) the day of his glorification, July 27 / August 9 is kept there as his primary feast day. Following is a fragment of a conversation between St Herman and some officers of a Russian ship, recorded by his disciple Yanovsky; it includes perhaps the most familiar quotation from St Herman. "But do you love God?" asked the Elder. And all answered: "Of course we love God. How can we not love God?" "And I, a sinner, have tried to love God for more than forty years, and I cannot say that I perfectly love Him," answered Father Herman, and began to explain how one must love God. "If we love someone," he said, "then we always think of that one, we strive to please that one; day and night our heart is preoccupied with that object. Is it in this way, gentlemen, that you love God? Do you often turn to Him, do you always remember Him, do you always pray to Him and fulfill His Holy commandments?" We had to admit that we did not. "For our good, for our happiness," concluded the Elder, "at least let us give a vow to ourselves, that from this day, from this hour, from this minute, we shall strive above all else to love God and to do His Holy Will!"